A simple freezer meal that the family will enjoy! 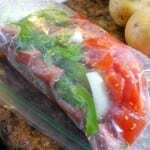 Throw together in a freezer bag. When you are ready to cook, cook in a slow cooker for 5 hours on low.